If there’s one thing Star Wars Battlefront nailed nearly two years ago, it was a real sense of authenticity. Even if the game was content hollow, it felt like being in a real Star Wars conflict. The sights, the sounds, the scale of it all lent itself to the overwhelming sense of happiness I felt as a Star Wars fan – until things got aerial. 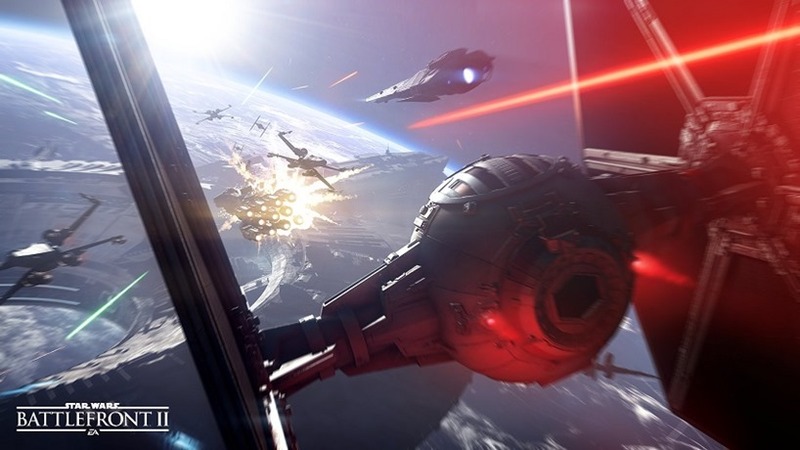 Battlefront’s dogfights were shallow and unwieldy, something which DICE is already addressing head on in the sequel. The new trailer can’t really show evidence of this, but man is it spectacular anyway. Leaning into the same sorts of feelings that should give any Star Wars fans goosies from a time long long ago, the new trailer for Battlefront II is all about showcasing those intense space battles. There’s everything from X-Wings to A-Wings, TIE Fighters and Interceptors. Starfighter Assault is the mode DICE are going to be focusing on during Gamescom this week, and it looks utterly gorgeous in motion. Check it out. Of course, none of this matters if the systems underneath all those fancy explosions and stunning effects are the same. Aerial battles are getting a rework in the sequel, with DICE stating that they’ve vastly improved fights to make them feel faster, tighter and more authentic to what you see on the silver screen. A tall order when you’re faced with limited spaces to fly and accessibility to controls themselves, but we’re bound to find out more soon enough. And I hope they’ve nailed it too, because the rest of Battlefront II so far feels like a good step in the right direction. It’s out in November.